Rossari Biotech is one of India’s leading manufacturers and exporters of textile chemical auxiliaries, enzymes, polymers and animal health care products. 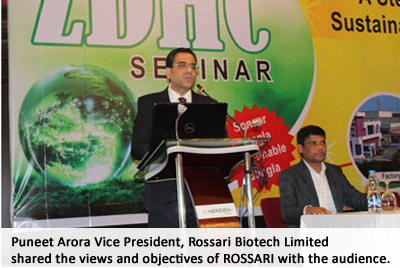 Founded in 1997, Rossari Biotech Ltd. was the brainchild of the two founding partners, Edward Menezes and Sunil Chari. 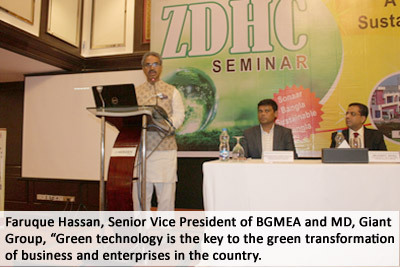 The company organised a seminar titled ‘A Step Towards Sustainable Textiles’ on 3 August 2018 to promote sustainability in the textile industry of Bangladesh. The theme of the seminar was ‘Shonar Bangla Sustainable Bangla’. “With an unbeatable combination of R&D and best technical support, Rossari is constantly striving for and coming out with newer products and molecules. Rossari has products for textiles, spatiality chemicals for coatings, paints, and inks. Rossari also has animal health & nutrition, silicone oil, laundry & industrial cleaning chemicals and polymers for paints, ceramics, water treatment, paper & textiles products,” Puneet Arora said. Rossari started its business in 1996, which was accorded as a one star Export House in 2016 and in 2008 the company received an SE-1A rating for highest performance capability and high financial strength from Crisil. Its products are regularly exporting to 17 different countries all over the world. The products are successfully tested by the R&D team and approved by the marketing team before being forwarded for the pilot scale production, which is a mini replica of the full-fledged production plant. The developed product is then tested for its commercial viability and is scaled up to a commercial level of production. Rossari has joint venture business with Buzil, Unilever, Hydra Italia & Cyra Chem. Puneet Arora mentioned in his speech that Rossari was recognized as the ‘Star Performer 2018 for Innovation’ by Arvind Industries for consistency in delivering quality products, in-depth and Key performance in Continuous Bleaching Range (CBR) system. According to the UN, a child dies from water-related disease every 15 seconds in the world. Textile industry is known as one of the most polluting industries. There are lots of factories in the world where the wastewater discharged from a textile manufacturing plant is not treated enough to remove all these hazardous substances from going into the river. There are chemicals present which can cause certain death, chemicals which can damage skin or cause irritation and there are chemicals which are now known as cancer-causing chemicals. The chemicals which are produced are not limited to the production area but it is transported either through water or through air to various parts of the world even to the North Pole, explained Prasad. The ZDHC MRSL is a list of chemical substances that should be banned from usage by the industry in the production of textile, apparel, leather, and footwear. The ZDHC MRSL applies to chemicals used in facilities that process materials and trim parts for use in the industry, he said. Chemicals in the ZDHC MRSL include solvents, cleaners, adhesives, paints, inks, detergents, dyes, colorants, auxiliaries, coatings and finishing agents used during raw material production, wet-processing, maintenance, wastewater treatment, sanitation and pest control. The RSL governs the outputs (finished product) to protect consumers.